Since CDM broke details of the new Brian Moore USB-based guitar, many of you have been asking: if you can carry audio over a USB cable, why not simultaneous audio and MIDI data? With both, you could both record audio and control soft synths. 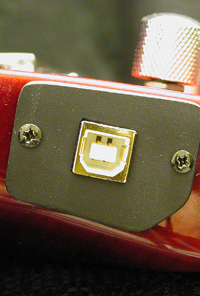 Electric guitars, of course, don’t transmit MIDI directly since they’re analog instruments, but could the circuitry that made the conversion be included on the instrument for a single-cable, plug-and-play solution? (createdigitalmusic) for future product updates. Of course, if you don’t want to control some wacky software synthesizer with your guitar or input notes for notation, the current models may still make sense. For about US$500, you have an all-in-one, USB audio guitar solution. But the mobility of the system is certainly increasing: one guitar, one USB cable, one laptop, and nothing else. Numark iDJ Reviewed by “Playlist”, Twice; Does Vinyl Beat `Pod?